The Great Steak Experiment! - Cooking With C.C. BlogHome » Blog » The Great Steak Experiment! One of my favorite magazines is “Cook’s Illustrated.” This months issue has an article about “Bringing Home Argentine Grilled Steak.” What I most enjoy about this magazine is the explanation through everything they tried to get to the final recipe and method……this one sounded just crazy and bizarre enough that I had to try it. The goal is to get a deep brown crust while grilling the steak. In Argentina, the steaks are cooked around a wood fire for a long time – so, can we get a similar result with my basic Charbroil gas grill. The problem – get rid of the surface moisture so its dry enough for a crust to form. What method did Andrew end up using? A rub of salt and corn starch and a 30 minute trip to the freezer – that’s right – 30 minutes in the freezer before it hits the grill. Like I said, when I read this is sounded just crazy and bizarre enough that if they put it in print, it just might work. After reading this article while I was on the road this week, it was settled. 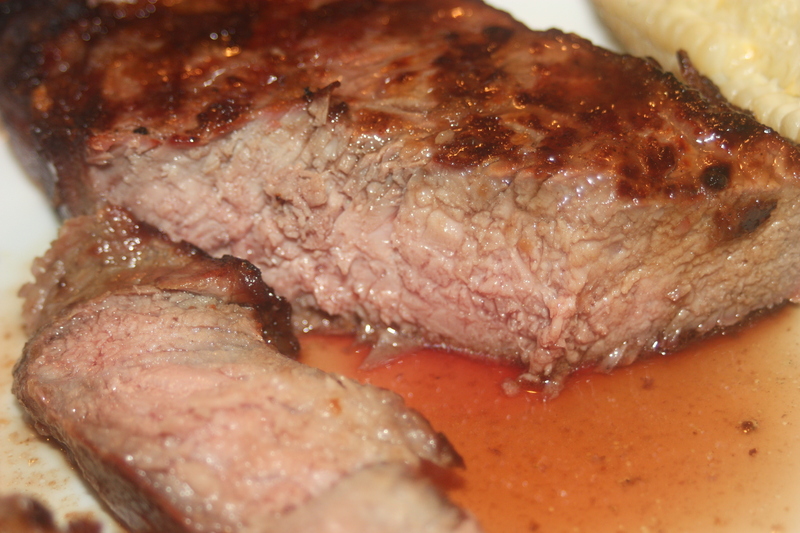 New York Strip steaks with this method for dinner Saturday night. Of course, you can’t JUST have steak (although I’m not sure why not, but you can’t). While shopping, a trip to the Madison County Farmers Market found us with a fresh batch of Silver Queen corn and some beautiful tomatoes. 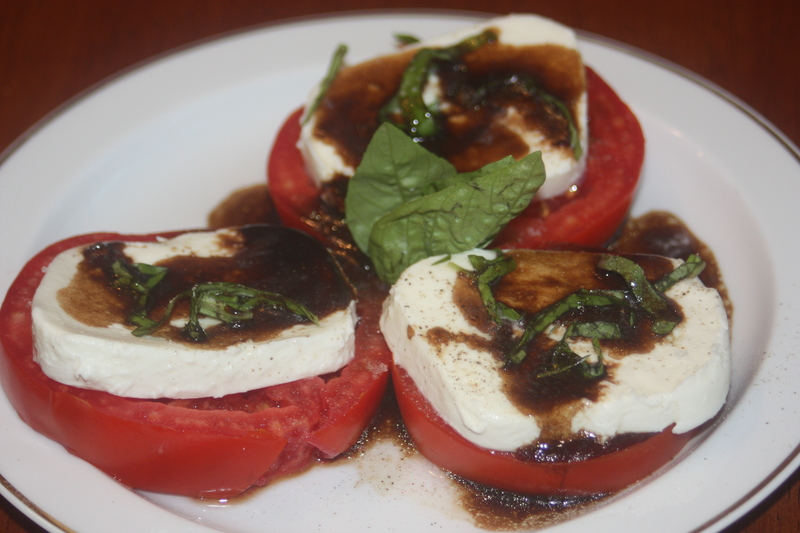 Picked up Bel Gioso Mozzarella Cheese and the menu was set – Caprese Salad, corn and steaks. I made the corn starch and salt rub and put it on both sides of the steaks. The steaks went into the freezer for their 30 minute stay. I fired up the grill and got it very hot (the instructions are to run all burners on high for the entire time!). 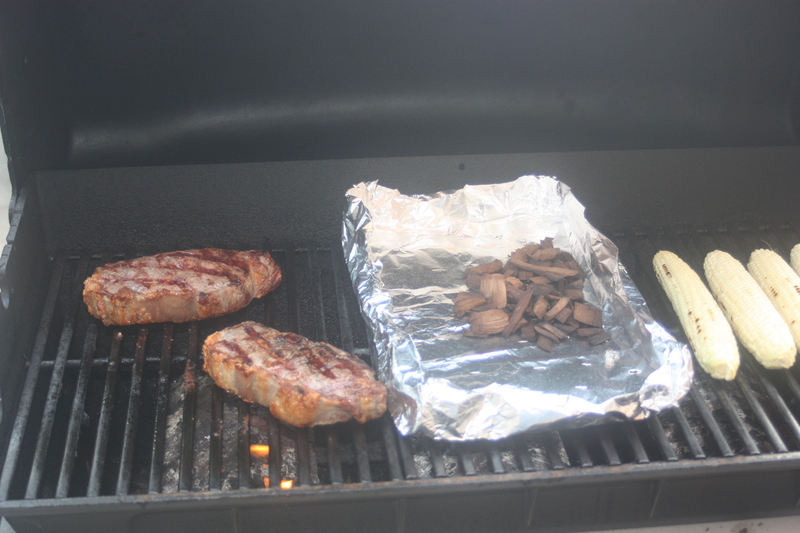 I also made a foil pack for the wood chips and a bit of hickory smoke in the grill certainly can’t hurt. I pulled the steaks from the freezer and the surface had a lot of moisture on it – maybe the salt and corn starch did their job (along with the VERY low humidity air in a freezer) and dried out the surface meat. From the freezer, straight onto the blazing hot grill. Two minutes later, the first turn. 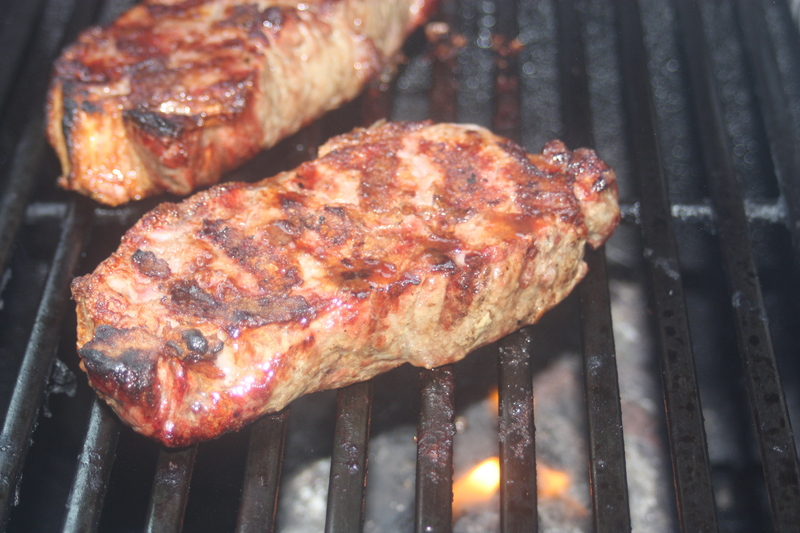 The surface looked gray with some grill marks – getting a bit nervous at this point, not looking real appetizing. Two more minutes, turn it again. Second side, ugly gray. Three minutes later, flip again. Now, nice grill marks and a slight brown starting to show. Three more minutes and I start checking for doneness. Lori doesn’t like really rare, so I need hers to get to 135 degrees Farenheit. Not there yet…. leave them on for another two minutes. Still isn’t hot enough, so I decided to flip it. Wow – nice looking steak now. Two more minutes and hers is at 137 degrees, mine is at about 120 degrees – PERFECT! The steak - just before it disappeared! Off the grill and to the table. Lori had been a bit impatient and was just waiting to dive into the tomatoes and mozzarella – but she did wait for me. 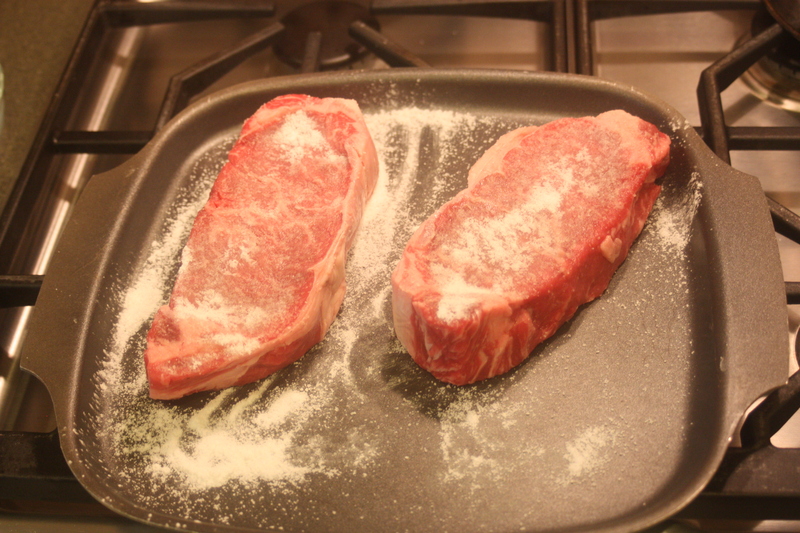 Cut into the steaks – center is just the way we like it, nice surface. Now came the real test…..put the steak into my mouth and man oh man! It was good! This crazy sounding way to grill just might have something to it! 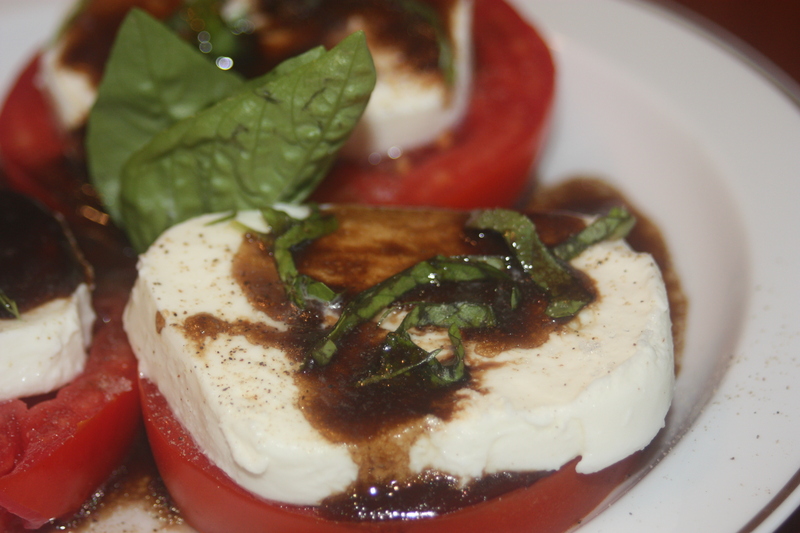 Note: Don’t miss the Heat of Summer Class next Saturday night – will be making the Caprese Salad from above plus other great dishes – see the website or Facebook page for more information. Perfect Pies & Tarts – King Arthur Flour comes to town! Sign up for our newsletter - receive information about news classes, upcoming events and promotions.